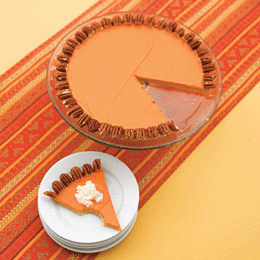 Disguised as a certain pumpkin-flavored dessert, this oversize sugar cookie will add a whimsical touch to your Thanksgiving table. Heat the oven to 350 degrees. Lightly dust a sheet of parchment paper and a rolling pin with flour. On the paper, roll out the dough into a 9.5 to 10 inch circle. Place a 9-inch pie pan on top and trim away the dough's edges. Transfer the dough round, on the paper, to a cookie sheet and bake it until golden brown, 15 to 20 minutes (do not overbake). Let it cool 1 minute, then carefully transfer it, still on the paper, to a rack to cool completely.